We’d love your help. Let us know what’s wrong with this preview of Cimarronin by Neal Stephenson. 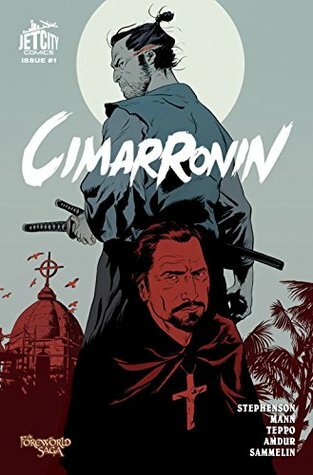 A disgraced outcast samurai living in early seventeenth-century Spain, Kitazume is contemplating ritual suicide when a divine force (of a sort) intervenes: Luis, a mischievous Jesuit priest and Kitazume’s longtime friend. At Luis’s insistence, the samurai agrees to help smuggle a Manchu princess to Mexico. But little does he know that he’s really been dragged into an epic A disgraced outcast samurai living in early seventeenth-century Spain, Kitazume is contemplating ritual suicide when a divine force (of a sort) intervenes: Luis, a mischievous Jesuit priest and Kitazume’s longtime friend. At Luis’s insistence, the samurai agrees to help smuggle a Manchu princess to Mexico. But little does he know that he’s really been dragged into an epic struggle for power. Several forces have their malicious sights set on the New World’s rich silver mines: an insurgent Spanish duke, political Chinese interests, and the escaped African slaves known as the cimarrónes. And working in secret among them is a mysterious, long-lost order that has its own plans for the precious metal. To ask other readers questions about Cimarronin, please sign up. Is this the first book? One word for this volume: WOW! I never read Foreworld Saga before, and I admit I checked this graphic novel for the cover art. The art is detail and realistic enough but not too gory. The setting is so exotic: a Japanese ronin, a (devious) Jesuit priest, Spaniards, and Manchurians! the first pages are successfully gripped my attention. wish the next volumes are as good as the this first one. The opening hooks one. It raises several questions that the reader will want answered: Why is a Japanese samurai hanging out in the Philip Cimarronin opens in Manila in 1632 with a masterless samurai (i.e. a ronin, hence the latter part of the name) about to commit ritual suicide. The ronin, Kitazume, is interrupted by a Catholic priest who Kitazume knows and who—it’s hinted—has the kind of nefarious past that one has trouble reconciling with the priesthood. The priest offers Kitazume a mission. The opening hooks one. It raises several questions that the reader will want answered: Why is a Japanese samurai hanging out in the Philippines in 1632? Students of Asian history will recognize that Japan’s long warring period is a couple decades past and there are a lot of warriors out of work. But is that all? Is the priest really a priest, and, if so, how does a blackguard end up a holy man? And most crucially, will Kitazume take the mission, and—if so—will he succeed (and will he be glad he did?) The reader always knows that the priest has something up his sleeve, but it’s only gradually revealed what that is. A beautiful graphic novel! Historically well researched, and a fun read! I hope there are many more! I bought this out of curiosity. I am not generally a reader of graphic novels, Manga, etc., but I was intrigued to see Neal Stephenson's name on the story. Overall the story was good, but not exceptional with bringing a ronin to New Spain and also coming along is a Chinese princess. There is a pretty good backstory of renegade slaves and the politics of the time in Spain, Japan and China. Perhaps I under rate the book because I am less appreciative of the media form. Una historia de detectives con peleas entre Chinos Japoneses, Españoles y Aztecas. Sí. Un samurai en la nueva España. Sí. Una princesa guerrera en peligro. Oh Dios mío sí! Muy divertido y muy bien dibujado. La historia tiene tantas cosas geniales que es casi imposible quejarse de lo poco realista que es. The attention to detail and the story flow make this series great. The history is well-researched as are the combat situations. ...still, the Ronin literature is hard to break into without a truly compelling plot line. This is only slightly interesting. Fun graphic novel and fanciful story, but wouldn't have read it — even from library — if it weren't for Neal Stephenson listed as an author. Bonus point for the puntastic title.